The HP-TR1 and HP-TR2 are dual action, internal mix airbrushes that feature a unique pistol trigger that is comfortable and smooth. The models are great for custom automotive painting since the design offers a similar feel and comfort typical of spray gun usage. The pistol grip filter is not just a hand-rest, but a dependable moisture trap. 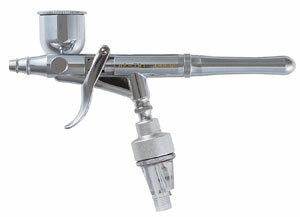 The ergonomic, balanced handle makes for easy, level spraying, giving you full control over your paint and spray pattern. Both models include a Iwata Pistol-Grip Filter and a 1½ oz side-mount color cup. They can also be used with Iwata 1 oz and 2 oz side-mount bottle sets, which are available separately.